Our power panel back in April of last year was a hugely popular event, and in our survey feedback many members have told us they want to hear more from our very own SBWN constituency. So for our March event we have five speakers lined up, drawn from the rich and diverse membership of the Southern Business Women's Network. Kate works in the tourism industry. With a senior management role in a family run Holiday Park business, she is responsible for marketing, public relations, human resources and the day to day running of three parks. Kate is also busy working on bigger picture projects with many local and regional tourism bodies. Sue first entered the finance industry back in 1986 when she joined NAB as a clerk and worked her way through the ranks, honing her financial and customer service skills along the way. Sue left to start a family and has now transferred her skill set to an administration and bookkeeping business of her own. Sue sees her role as that of educator, helping her clients simplify many of the often complex compliance tasks of running a business. Jane McGillivray is in education and as head of middle school at Newhaven College, with three sub schools under her jurisdiction, she manages over thirty staff, leads curriculum innovation and is charged with the pastoral care of her students, who travel from a wide catchment area. Jane is also responsible for a considerable budget and working collaboratively with the wider community. An expert in all things skin and beauty Sonia Pastuszyn has been in the beauty therapy industry for over 14 years. During this time she has worked in and managed numerous salons, gained internationally recognized training and a Diploma of Beauty Therapy from Victoria University. For the past three years Sonia has run her own salon, Sonia’s Beauty Boutique, in Wonthaggi. With a background in marketing, project and product management, Chelsea Taylor has over 20 years’ experience in the IT and Finance Industries, holding positions with Hewlett-Packard, NAB and Visa Worldwide Services. Proving that a remote location and motherhood is no barrier to corporate success, Chelsea has spent the last decade working for Visa’s Singapore office from her home in Walkerville, South Gippsland. During this time, Chelsea has been responsible for managing the rollout of Visa’s Commercial Card software solutions to financial institutions and corporate clients across Australia and New Zealand, whilst raising her two children. Chelsea attributes her corporate success to the “Three R’s” of Responsibility, Relationships and Respect-for-self and is passionate about giving back and supporting others to achieve their goals. As part of SBWN’s mission to ‘give back to the broader community’ our organisation awarded the newly created ‘SBWN Leadership Initiative Awards’ in December 2015 to some very deserving young women who have been invited to join us at this month’s dinner, gaining some valuable inspiration from our membership – just like the rest of us! Our March SBWN Dinner Event backdrop is the historic Ruby Hall with Brent Sinclair Catering once again delivering beautiful food using the best produce from a range of local suppliers. Brent and his team have earned a well-deserved reputation for presenting exceptional food that is both delicious and good for you! Yumm. Boutique vineyard, Lucinda Estate also of Leongatha will be running the bar at the event. Local produce takes a starring role again this month! 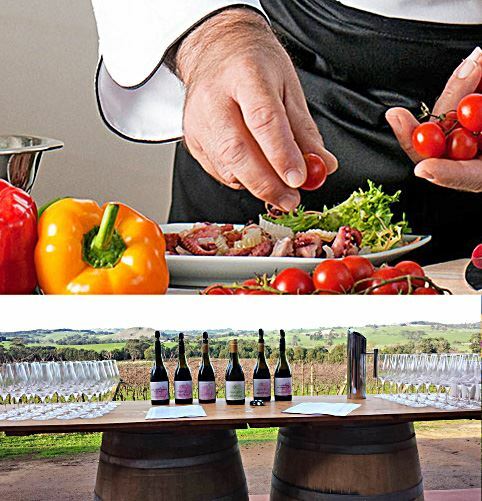 Top: Brent Sinclair Catering will be providing delicious fare at our March dinner event at Ruby Hall near Leongatha. Bottom: Lucinda Estate winery will run the bar for us.